pssst – in case you missed it, I shared a few tips on taking photos of kids here. eventually we’d like to get a swing for Wolf. he LOVES swinging and I’d love to have one at our own house. and being the advocate of less plastic that I am, I’ve gotten my head stuck on a wooden swing. I’ve had visions of pushing Wolf in a fancy wooden swing in the backyard in our dream house and a few weeks ago, I pinned a wooden swing image that I’d sourced back to an old Domino magazine with no references. since then, I’ve been madly on the hunt. today while on the search again, I not only found that swing but I also found the jackpot swing. I’ve only just begun to break ground in crocheting, but naturally I want to try my hand at knitting too. so that I could make an entire shelf of safari friends for our little man, of course. I love this beautiful, self-published book from Wilde Dieren titled Wild Animals. adorable clothes and photography from Flour Clothing. many of you might not know this, but my daddy was a pirate. that’s right. a swashbuckling, gun-shooting, treasure stealing pirate in the Gasparilla parade in Tampa, Florida. 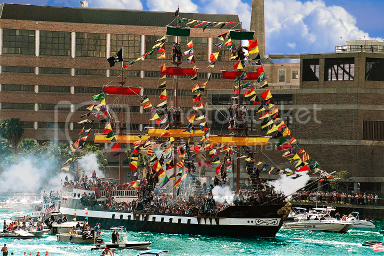 every year in late January, the pirates invade the city on a full sized pirate ship and proceed to parade through the street throwing beads and other goodies to the parade watchers. my dad would wear a big, scary black wig, aviator sunglasses, and get nasty scars and bullet wounds painted on his face. at 6’6″ all decked out in his pirate gear, he was kind of scary! even though I don’t live in Tampa anymore, a little piece of my heart will always remain there. I get especially nostalgic this time of year when everyone is preparing for the pirates to invade the city. needless to say, I think I’d buy this tee for our little man, even if we weren’t there. I’m sure he’d be the cutest pirate on the block.